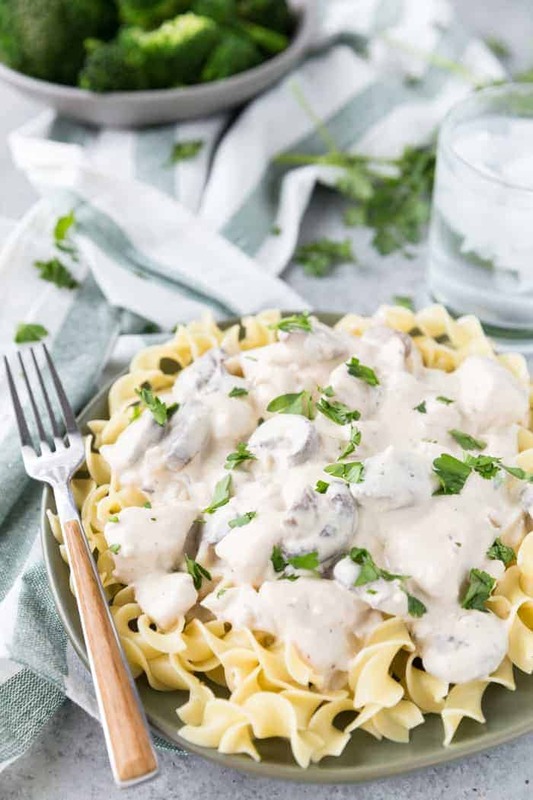 Creamy Chicken Stroganoff with mushrooms features tender chicken and mushrooms smothered in a rich creamy sauce. 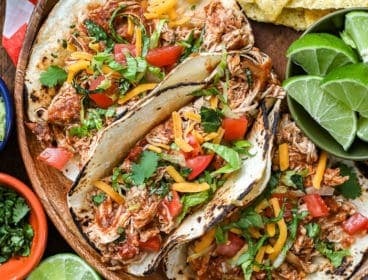 This dish takes only about 30 minutes start to finish making it the perfect weeknight meal! 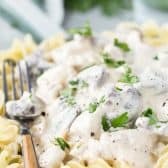 We love to serve this easy Chicken Stroganoff over egg noodles with a side salad and some crusty bread for the perfect meal! 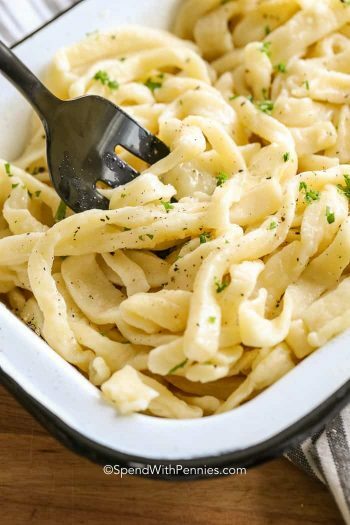 I love a good quick weeknight meal (like this amazing 30 Minute Garlic Shrimp Alfredo). Having quick meals in your arsenal means less weeknight stress! I grew up eating stroganoff. 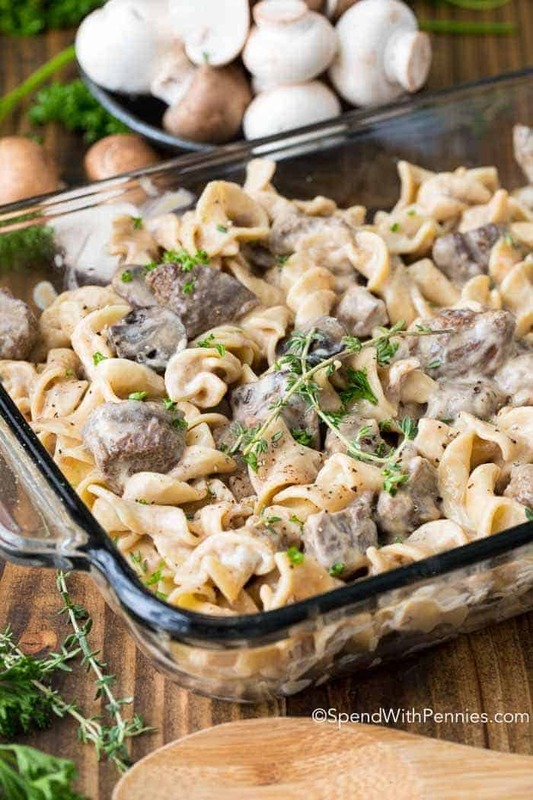 My mom would make a crock pot beef stroganoff that we loved. 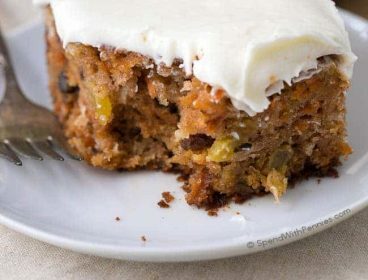 I actually recreated it for my site a few years ago and it is one of my most popular recipes. 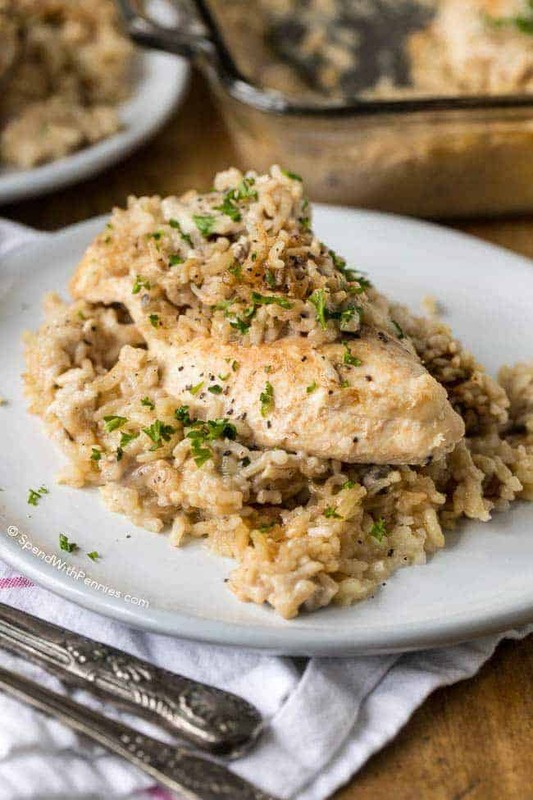 While Beef Stroganoff tends to be the most common, I love making chicken stroganoff. 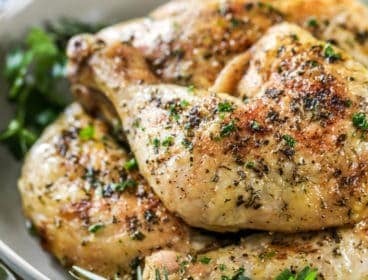 Chicken is easy to come by, totally versatile, often cheaper to buy and my kids love it! So I took the creamy, flavorful sauce of the beef stroganoff, and made a chicken version. 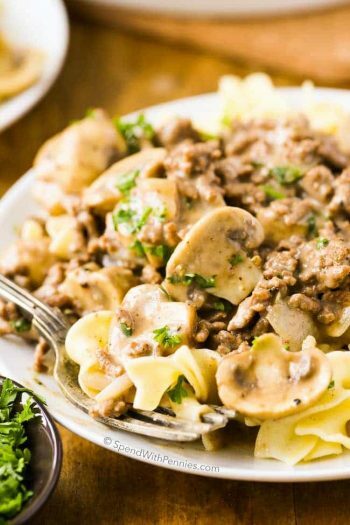 Most of the time stroganoff recipes use a cream of something soup, cream cheese, sour cream etc. The normal line up of ingredients is pretty standard. But I wanted to make a version without cream of mushroom soup or any canned soups at all, and this chicken stroganoff is it. Instead, this recipe uses chicken stock, fresh mushrooms and some cream cheese for extra richness! 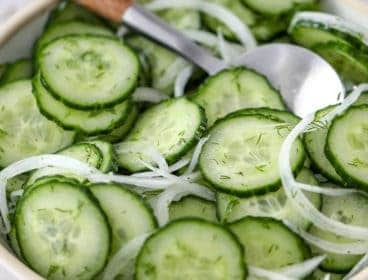 It can be adjusted to be a skinny version by using light versions of the various ingredients. 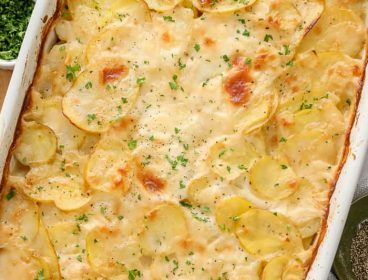 A light sour cream and light cream cheese can make this a skinny dish. One of the important parts of this recipe is the roux. Basically it is butter and flour, that you cook together so it looks like crumbs, then you whisk in your liquid, in this case, chicken stock. And it thickens it into the nice creamy sauce which is the perfect base for this chicken stroganoff. 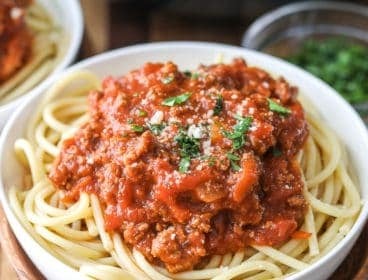 It is awesome, and despite the fancy name, so super easy to do. And if you can’t find baby bella mushrooms, white mushrooms work. The baby bella just have a slightly deeper flavor profile. 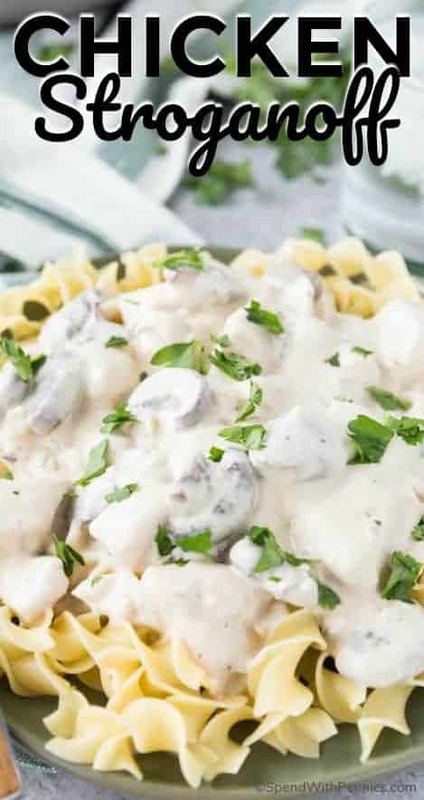 Chicken Stroganoff is something my kids never complain when eating because it is so creamy and tasty. 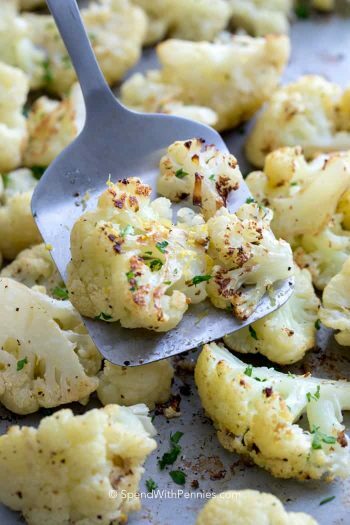 I love to add a nice side of vegetables too! Or a salad. 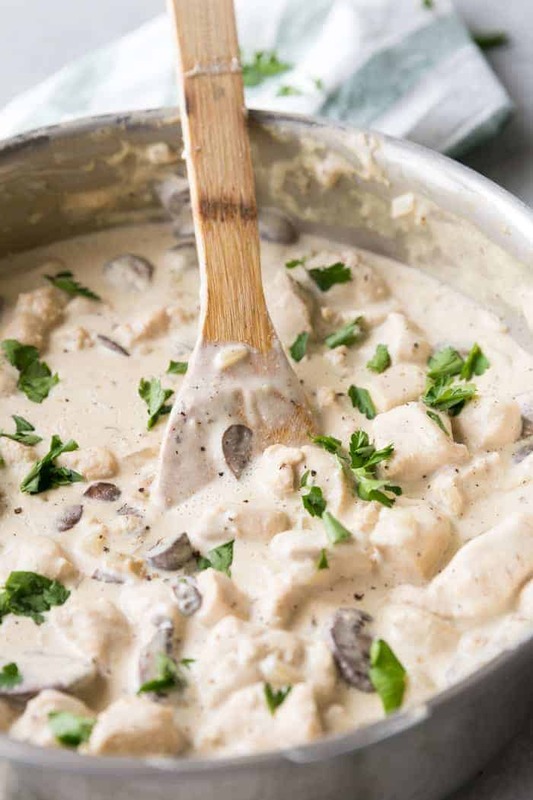 This Chicken Stroganoff is awesome served with some Homemade Buttermilk Biscuits to sop up any leftover sauce and of course a side of veggies or a simple and fresh Cucumber Dill Salad. 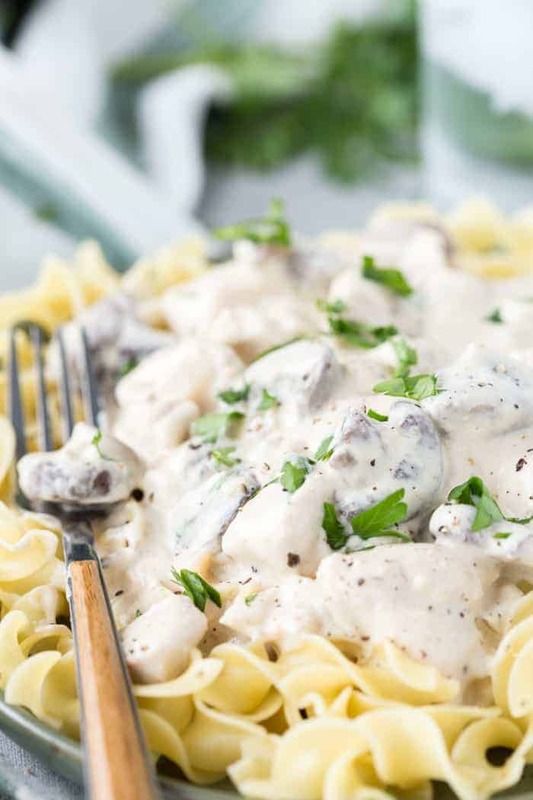 Chicken Stroganoff is a delicious and easy weeknight meal made with tender chicken, succulent mushrooms and a creamy sauce that is perfect served over egg noodles. In a large skillet, add 1 Tbs olive oil, and 2 tsps minced garlic, and saute for 1 minute. Add chicken to pan, and saute until browned on all sides, but not cooked through. 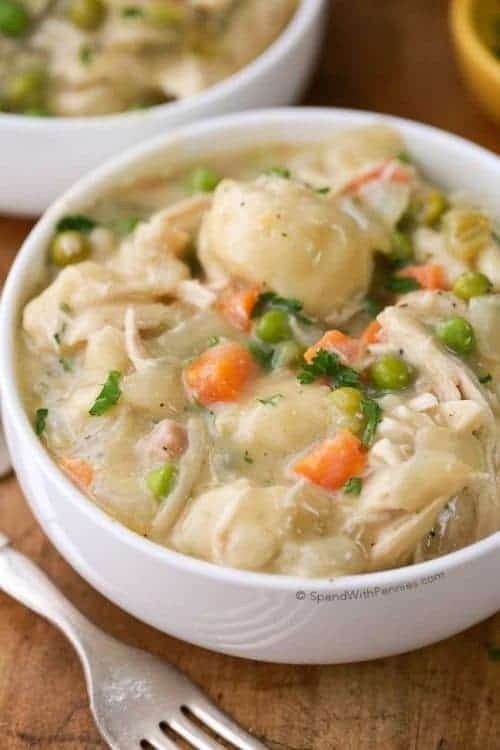 Remove chicken, placing it in a large bowl, and set aside. Add remaining butter to skillet. 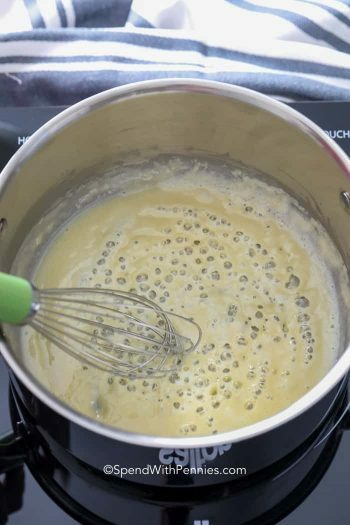 Add flour, and whisk it together, making a roux. Add chicken broth, slowly, stirring constantly so it doesn’t get lumpy. Stir in ground mustard, garlic powder, onion powder, cream cheese and sour cream. Stir in chicken and vegetables, and let simmer for a few minutes, until heated through. *Calorie count does not include egg noodles.